Euro Tachograph Solutions (ETS) is a young company which provides tachograph analysis to hauliers, coach operators, fleet hire companies and waste management companies nationwide. With over 30 years’experience in the transport industry, the ETS team has a vast knowledge of the tasks that face drivers and transport managers daily. In addition, the team has been in trained in (EC)561/2006 drivers’hours by City & Guilds. 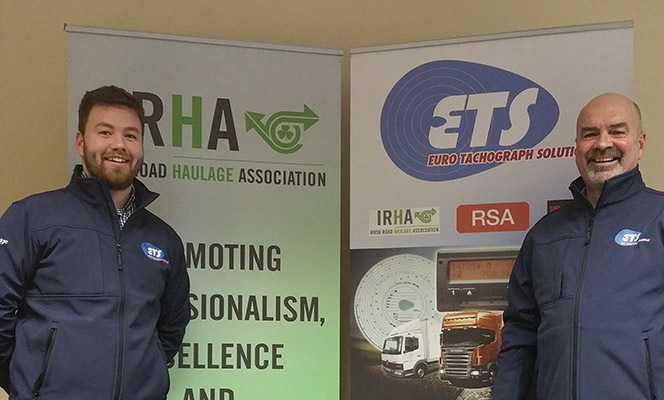 Father-and-son Alan and Ciaran Nugent set up ETS in Waterford in 2013 after identifying a niche in the market for tachograph analysis solutions. Since then, the company has built up a large client-base across the industry, including the likes of Barry’s Travel, Clem Jacob Hire, Crosbie Transcar and Greenstar, and is attracting between three and five new customers every week. 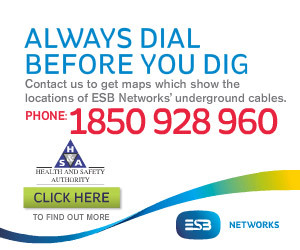 ETS are the only authorised Stoneridge partner in fleet products in the Republic of Ireland are also agents for OPTAC3, which is the analysis system product of Stoneridge, and EasyTac. Thousands of drivers come through the OPTAC3 system for analysis on a monthly basis and this figure is growing all the time. The partnership with Stoneridge commenced in 2014 and members of both teams make regular trips to the Stoneridge and ETS offices in Dundee and Waterford respectively. ETS staff have been trained in all Stoneridge products and can advise or offer support for any queries a customer may have regarding analysis or downloading equipment. ETS can also tailor a variety of training programmes to meet the needs of individuals and fleets alike. With a range of training courses and videos, ETS make things simple and easy for clients. “We’re very busy I’m pleased to say. We have a wide range of products to suit large fleets, small fleets and owner drivers. Stoneridge is our main agency, while our new partnership with EasyTac has brought a further 600 customers onto our books,”Alan explains. A top-selling product, Stoneridge’s bespoke OPTAC3 tachograph analysis software means it doesn’t cost to stay compliant. It is designed with efficiency in mind, saving your business valuable time and money, and keeping your working days hassle free. The main aim of OPTAC3 tachograph analysis is to keep your drivers legal and compliant with the Drivers’Hours Legislation and the Working Time Directive. It automatically checks the tachograph data against legislation and displays summaries and infringements in a clear, easy-to-understand format. With 32 different driver and vehicle reports in 21 languages, tachograph analysis has never been so easy. Other Stoneridge products include the SE5000 Exakt Duo2, DigiFOBpro, Digipostpro, DigiDL Remote Downloader and Tacho Link. In developing its newest tachograph - SE5000 Exakt Duo2 –Stoneridge discovered that many drivers often run over their daily driving time or take too short a break. So it created duo technology, the decision support tool that displays real-time updates on driving and rest time. This helps to stay legal, optimise drivers’time on the road and adapt to any changes in their journey. Thanks to the customer, the SE5000 Exakt Duo2 is Stoneridge’s smartest One Minute Rule tachograph yet. Stoneridge has added all the features you’ve asked for, including Working Time Directive calculation. These ensure drivers know exactly how long they’ve been working for, meaning fewer infringements and fewer costly fines. And with this accurate data to hand, you’ll be able to plan your week more effectively. The tachograph and smartcard data can be downloaded so the tachograph data can be analysed using tachograph analysis software. Featuring a high visibility LCD screen that makes it even easier to view driver information, Stoneridge DigiFOBpro gives you immediate access to driver card and VU data, giving you an instant overview and checking compliance with EU regulations. DigiFOBpro allows you to selectively download data from your digital tachograph, saving time on unnecessary full downloads. You can then transfer the data to a PC for on-screen data management. This includes speed trace information, faults / events and incremental and date-ranged activity. Stoneridge Digipostpro is the ideal solution for downloading and transmitting tachograph data. It is a download tool designed with ease of use and flexibility in mind. Drivers can quickly and easily upload their data to this wall-mounted unit, which is then automatically transferred to a central location via a local network (LAN) or over the mobile phone network (GPRS) using secure authentication methods. In addition, Digipostpro comes with its own download key, the digivu, for fast and easy download and upload for your vehicles. It is also designed to work with the DigiFOBpro. The Stoneridge DigiDL remote downloader allows you to download tachograph data from anywhere in the world. Working alongside any digital tachograph with remote download functionality –including the SE5000 Exact Duo –the DigiDL enables you to remotely download VU and driver data securely using GPRS technology. It gives you an automated, centralised data transfer, so you know exactly when and where you will receive your tachograph information. And because the DigiDL removes the need for time-consuming manual downloads, you’ll gain more driving time too. With the Tacho Link dongle, users can take advantage of two free Stoneridge apps –Tacho Center to download digital tachograph data and Duo Mobile to get real-time updates on your driving time. Tacho Link can be fitted to any digital tachograph and connects to Android smartphones via Bluetooth. It also comes with a free modified SE5000 digital tachograph printer cassette to allow insertion of the dongle into any Stoneridge digital tachograph without the removal of the printer cassette. EasyTac was launched in 2006 as a low-cost solution for transport operators to meet their legal requirements for downloading digital tachographs. Since then, EasyTac has been using its technical expertise and close industry relationships to continuously add and improve functionality and features to best suit the needs of customers. Three EasyTac products available from ETS are the Complete Kit, VU Digidown Data Downloader and Smartcard Reader. EasyTac’s Complete Kit provides all the equipment required to download, analyse, store and export tachograph data. The kit enables users to download vehicle units and driver cards and allows the transport manager to carry out all the checks required under Tachograph Regulations and the Working Time Directive. EasyTac VU Digidown Data Downloader devices plug into the vehicle unit and transfer the stored data from the digital tachograph which can be copied onto a PC. Each vehicle unit has sufficient internal memory to store up to a year’s worth of activity and diagnostic information so, unlike the drivers’cards, the VU download process doesn’t have to be done very often. Connecting to the PC, usually via USB, the EasyTac Smartcard Reader is inserted into the reader which enables data to be read from the chip on the card. The Smartcard reader will not read the card unless appropriate software, such as the EasyTac downloader, has been installed. This software communicates between the PC and smartcard reader, writing the raw data into a standard, tamper-proof file format as required by the digital tachograph legislation. The data is then used to create various reports such as graphs and tables of activity. The team at ETS would love to hear from you!